John E. Thies | Webber & Thies, P.C. Business Representation; General Litigation; Appellate Litigation; Real Estate. A past president of the Illinois State Bar Association, Mr. Thies concentrates his practice in the areas of business representation, general litigation, appeals and real estate. 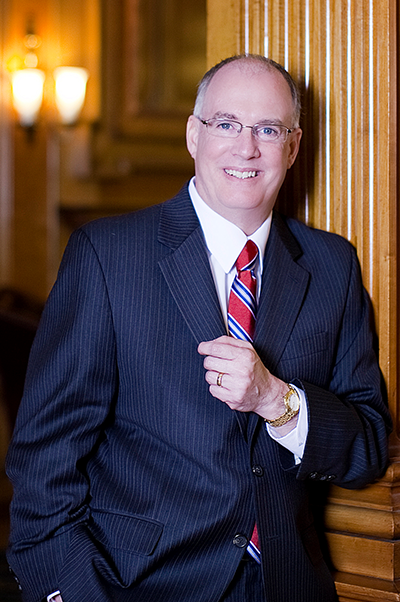 He has a broad range of experience, which includes the litigation of matters throughout the state of Illinois, from trial courts to the Illinois Supreme Court. Representative cases include serving as co-counsel on behalf of the successful appellant in two significant Illinois Consumer Fraud Act putative class actions litigated in the Illinois Supreme Court, Shannon v. Boise Cascade Corporation, 208 Ill.2d 517, 805 N.E.2d 213, and Oliveira v. Amoco Oil Company, 201 Ill.2d 134, 776 N.E.2d 151. In the area of labor and employment, Mr. Thies successfully litigated (and was lead counsel in) the case of Mills v. Health Care Service Corporation, 171 F.3d 450 in the Seventh Circuit Court of Appeals, which established new law in the area of reverse gender discrimination. The Mills case has been cited hundreds of times across the nation. Besides practicing before federal and state courts, Mr. Thies also practices before a number of administrative bodies including the Illinois Human Rights Commission, the Equal Employment Opportunity Commission, the National Labor Relations Board, and similar labor/management forums. He has also counseled clients in labor negotiations. Mr. Thies has also previously acted as a Special Assistant Illinois Attorney General. Mr. Thies has a Martindale-Hubbell peer review rating of AV, has earned the Super Lawyers designation by Law & Politics (limited to 5% of licensed active attorneys in Illinois) and has been selected for inclusion in the Leading Lawyers Network (which has designated him as being in the top ten downstate business lawyers in Illinois). A member of the Champaign County, Chicago, Illinois State and American Bar Associations (among other organizations), Mr. Thies is the current president of Land of Lincoln Legal Aid, a legal aid organization providing free civil legal services to low-income persons and senior citizens in 65 counties in central and southern Illinois. He is also past president of the National Caucus of State Bar Associations (a position he held while he was president of the Illinois State Bar Association), and is a member of the American Bar Association House of Delegates. He has served on the Executive Council of the National Conference of Bar Presidents and is past chair of the board of the ISBA Mutual Insurance Company. Mr. Thies is a fellow of both the American and Illinois State Bar Foundations, and a member of the U.S. Supreme Court Historical Society. By appointment of the Illinois Supreme Court, Mr. Thies is a past advisory member of the Illinois Judicial Conference’s Committee on Strategic Planning as well as a past member of the Court’s Committee on Character and Fitness (4th District). He has also served as a member of the Illinois Judicial Ethics Committee. Mr. Thies has frequently written on topics of interest to the profession (and public). Articles, president’s pages and opinion pieces published in the Illinois Bar Journal, practice newsletters, the Chicago Daily Law Bulletin and/or other newspapers and magazines have included, among others: Title IX: A Brother’s Reflections on an Olympic Gymnast, a Track Pioneer and a Nike Executive (ISBA Labor and Employment Section Newsletter, January, 2019); Consider Including a Philanthropy Project in Your Presidential Agenda (NCBP Newsletter, Winter, 2016); Co-Author, Limit Law Practice to Lawyers (American Bar Association Law Practice Magazine, July/August, 2016); The Importance of Celebrating our Legal Pillars (Central Illinois Business Magazine, April/May, 2016); It’s Time for Law Schools to Revise Their Curricula to Permit and Encourage ‘For Credit & Pay’ Externships (NCBP Newsletter, Spring, 2016); Micro Volunteering – How to Engage Limited Availability Volunteers (NCBP Newsletter, Fall, 2015); Managing Your Message – Making the Most of Every Day of Your Presidency (NCBP Newsletter, Spring, 2015); The Time for Serious Legal Education Reform is Now (IBJ, April, 2013); Our Profession Must Be a Champion for Civics Education (Illinois Lawyer Now, Spring, 2013, Chicago Daily Law Bulletin and other newspapers, Law Day, 2013); The Battle Against Greater Non-Lawyer Involvement in the Practice of Law (IBJ, January, 2013); The Case for Reform of Illinois Judicial Disqualification Standards (IBJ, September, 2012); The Bar’s Role in Legal Education Reform (IBJ, August, 2012); Costs of Taking Evidence Deposition of Out of State Physician Properly Awarded (ISBA Civil Practice Section Council Newsletter, April, 2009); Co-Author, Rethinking American Housing Policy: Defederalizing Subsidized Housing (University of Illinois Law Review, Vol. 1987, Issue, 4). Mr. Thies has served on numerous philanthropic boards and committees, frequently in leadership positions. A partial list includes: Cunningham Children’s Home Foundation (past President); Champaign-Urbana Community Schools Foundation (past Chair); Volunteer Center of Champaign County (past Chair); Urbana Free Library Board of Trustees (current member); Champaign-Urbana Kiwanis Club (past board member); Illinois Bar Foundation (past board member); and United Way of Champaign County (past board member). Together with his wife, Terry, he has led youth on a number of church mission trips to such locations as West Virginia, Mississippi and Mexico. While serving as ISBA President, he established the program Lawyers Feeding Illinois (chaired by Terry Thies) which to date has raised 4.6 million meals for low income individuals across the state. Mr. Thies and his wife, Terry, reside in Urbana with their two daughters.